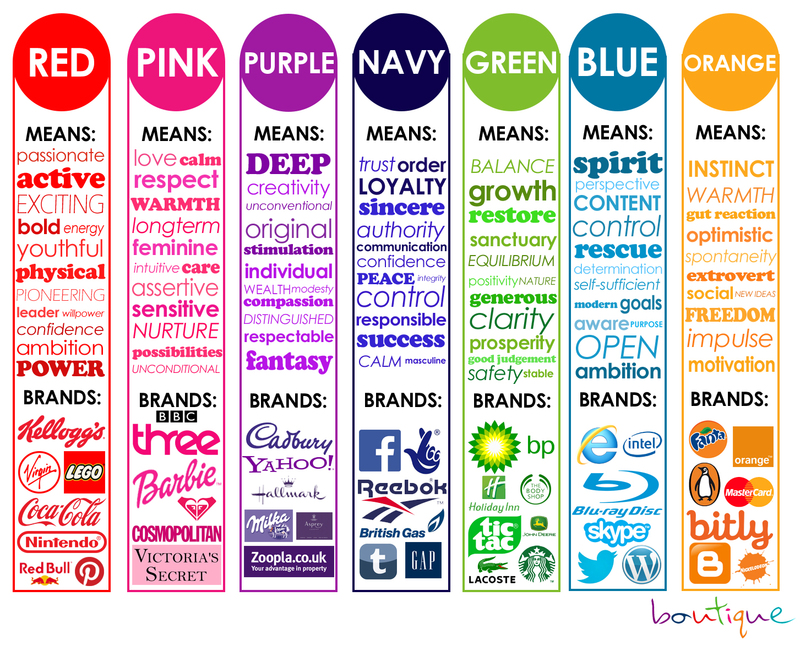 Have you ever wondered why color is so significant in identifying brands? Red is pretty much associated with Coke. Blue is the preferred color for IBM, HP, Facebook, and Dell. These large corporations have developed a confident brand identity by using logos with particular colors. Color also plays a vital role in retention: It stimulates the senses and delivers a message in half the time text does. Color psychology (as covered in Part 1) is the study of how colors affect our emotions and decision-making processes. It is a subdiscipline of behavioral psychology since it studies and identifies behavioral responses to colors. The branding process is very important. Defining your brand identity is critical as this will help you stand out from the crowd. Finding the right color to best identify your brand is not as simple as picking out colors from the color wheel--it will take an enormous amount of time. Identifying the most appropriate dominant color to use is essential to the success of your branding campaign. Prominent colors significant to your brand, mission and vision must be apparent in all your promotional materials, which necessarily include product packaging and labeling. In deciding which color to use in developing your brand identity, remember that it should be the color that particularly relates to your brand and it should be able to set you apart from all other trademarks, especially your competitors. In a previous post, we discussed how color evokes emotions. We further discussed how it is linked to a successful branding campaign. In the world of visual content marketing, one must understand how important colors are and how efficient, effective and persuasive they can be when properly used in visual content. 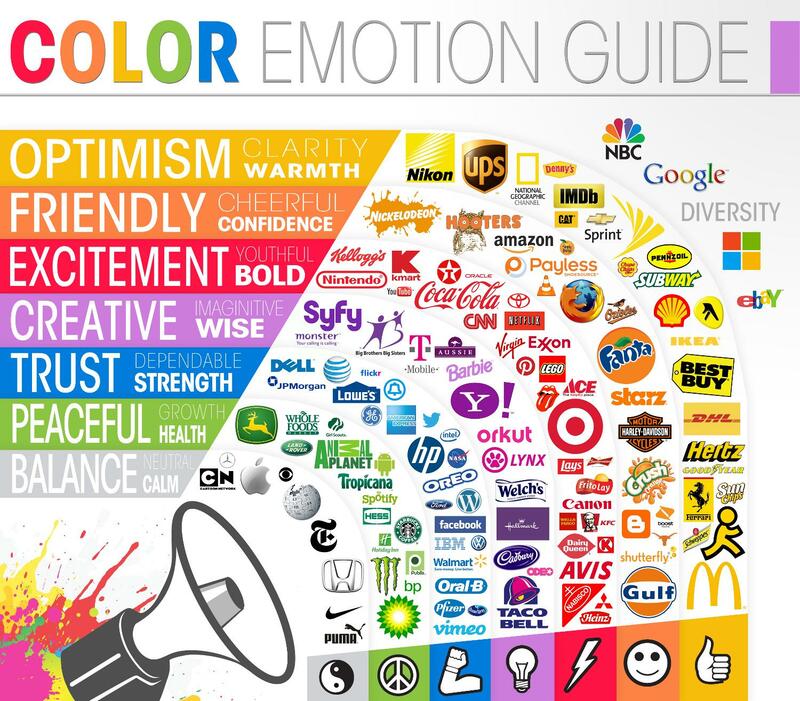 Although the psychological impact of colors is subjective, it is undeniable that they influence audience reaction. An article published by Satyendra Singh revealed that it only takes 90 seconds for buyers to formulate an opinion about a given product and that the colors used in the branding or product campaign make up 62 to 90 percent of the factors used to make their final decision. The emotional impact of color is dependent on cultural upbringing, awareness and orientation. There is no generic response, hence it’s much more difficult to predict successful reactions across a multicultural audience. There are generally accepted color meanings that include both positive and negative emotions. In one particular survey, a group of people were asked to pick the colors they associate with specific words. BLUE is the color of choice for reliability, security, and trust. This color came in second place when identifying high-quality or high-tech brands and third when associated with the word "courage." RED is mostly associated with fear or terror and, to some extent, overwhelming speed. This color also came in second for the word "courage." ORANGE is the color of choice for both fun and cheap--otherwise known as easy. PURPLE signifies courage, which is why valor ribbons are of this color. YELLOW is notably associated with lightness and anything non-serious or non-threatening. This is a safe color. GREEN almost always comes in second for the characteristics that are associated with the color blue. Undeniably, blue is the most powerful color since people trust its message of safety and protection. On the other hand, the color black signifies importance. This means that black can be a good color to use in your brand identity and marketing strategy if you're looking to elevate your authority. The book Color Psychology and Color Therapy by Faber Birren is a factual survey of how color influences real-life decisions. He categorically defines what reactions and specific actions individual colors have on everyday living. He states that bright and light colors excite muscles, so they increase productivity in performing physical work, while gentle and deep colors activate mental and visual activities. He also indicated that the color red plays a very important role in stimulating the central nervous system, while the color blue calms it down. Another interesting observation he makes is that brilliant colors make time go by a little slower, while red and other related colors seem to accelerate the passage of time. Color also means different things in different cultures. According to researcher Joe Hallock, the Inuit use 17 words for white to refer to different snow conditions, while people in the northwestern part of the United States use only 4 or 5. Every culture has a different understanding and interpretation of each color. A color can have a potent influence on religious belief, politics, art or ceremonial practices. Understanding color interpretations and reactions across cultures will aid you in developing your brand identity. 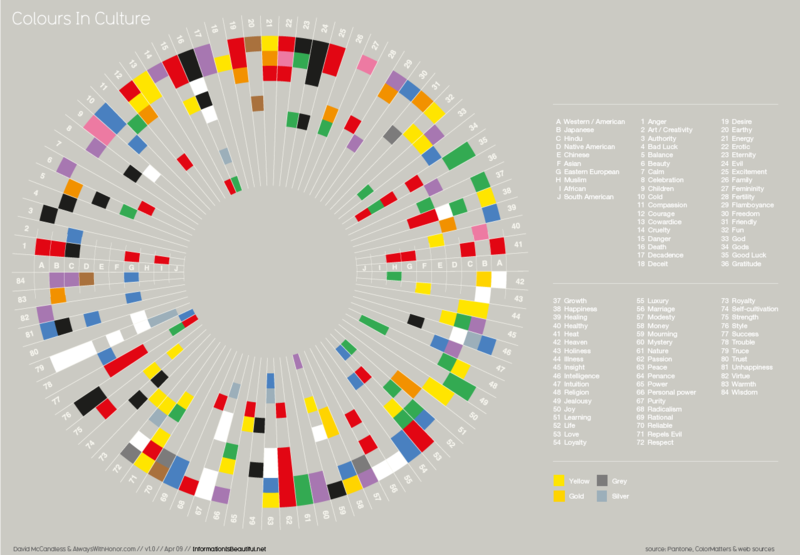 The image below is a visualization of how color is depicted around the world. In the infographic below by Kissmetric, you see how men and women react to colors. The infographic above and research conducted by Joe Hallock reveal how men and women interpret and react to color. Blue wins this round since the results show that both men and women are inclined to choose blue from among a wide selection. More than half (57%) of the men surveyed agreed that blue is their color of choice, and one-third of the women (35 %) responded the same. The study also pointed out that women are more aware of the differences in a specific color range, while men only see the most obvious color. Women, for example, know the difference between ordinary blue, cerulean blue, turquoise and all other shades and tones of blue. The takeaway: Men do not react to any other shade, only the color that is distinctly visible, while women are more inclined to be more aware of color codes. Simple. You can clearly choose which color to use for branding depending on the demographics of your target audience. If women are your audience, then you have to choose your colors carefully. On the other hand, if your brand targets mostly men, then using one dominant color is sufficient. How Does Color Affect Conversion? Are you still wondering why we have been talking about colors? When you create your website and develop your brand identity, you have to make sure that your website design and branding strategy are connecting with your audience. 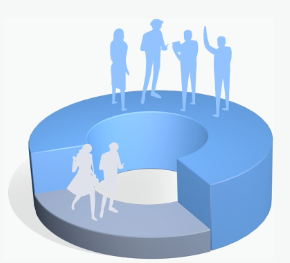 Is it engaging enough for them to follow a link, click a button or sign up for your offers? But what guarantees that placing a simple call-to-action is all that you need to encourage them to promote your brand? It takes less than 90 seconds for your audience to make a decision to subscribe or promote your product or service. In this time, you should visually engage your audience through the colors you use. 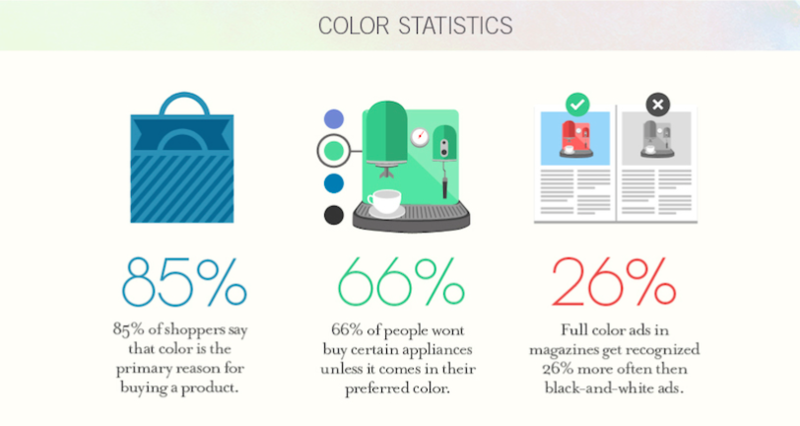 This infographic shows you how much color influences conversion. Note that 85 percent of consumers rely on colors when making decisions to purchase or not. And if you have a brand that stands out because of its impeccable visual branding qualities, then you can be certain that every ad campaign you put out there will be recognized and followed by your audience. The next time you settle on your click buttons or sign up pages, decide carefully which color to apply. Utilize this guide to choose the most appropriate color for your product or brand. 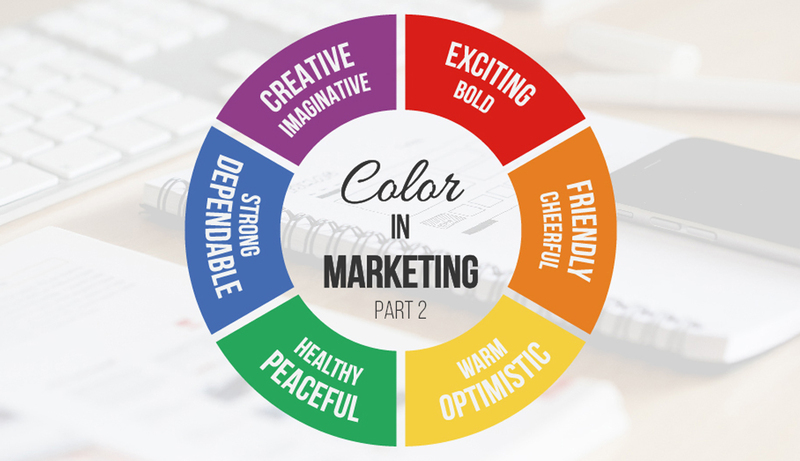 How Do You Use Color in Your Marketing Strategy? The goal of marketing is to get noticed and stand out. Refer to part 1 of this post on understanding the color wheel. Brand marketing, in simple terms, is dressing your product label so that it can get noticed. Dressing your brand properly, with the right color combination, can mean all the difference to standing out or being ignored. Using colors effectively and understanding how they affect human emotions and mental responses will greatly serve your brand awareness goals and brand identity development. Read our post on Visual Branding and learn how to engage your audience. well research Mydee. I appreciate you. I am a graphic designer am currently working on a logo design for a Transport company, we were discussing about the logo colors, shapes and text. Your article came in handy to freeze the logo colors. I would really appreciate if you could add more colors, and also add the negative connotations of the colors. Thanks for the feedback and suggestions. We’ll look into a third part of this post to look into those questions.